THIS ANTIQUE SECRETARY IS 30 INCHES WIDE, 17 INCHES DEEP AND 44 INCHES HIGH. IT IS 30 INCHES FROM THE FLOOR TO THE TOP OF THE WRITING BOARD. THE TOP HAS A 2 1/2 INCH BACKBOARD AND A FLAT SURFACE. THE WRITING BOARD FOLDS FOREWARD EXPOSING 6 CUBBY HOLES, TWO SMALL DRAWERS AND 2 PENCIL/PEN HOLDERS. BELOW THE WRITING BOARD IS A FULL WIDTH DRAWER. IT STANDS ON DAINTY CORNER LEGS. THE FRONT ONES ARE CARVED. AT THE BASE THE LEGS ARE JOINED BY A CURVED FOOT BOARD. 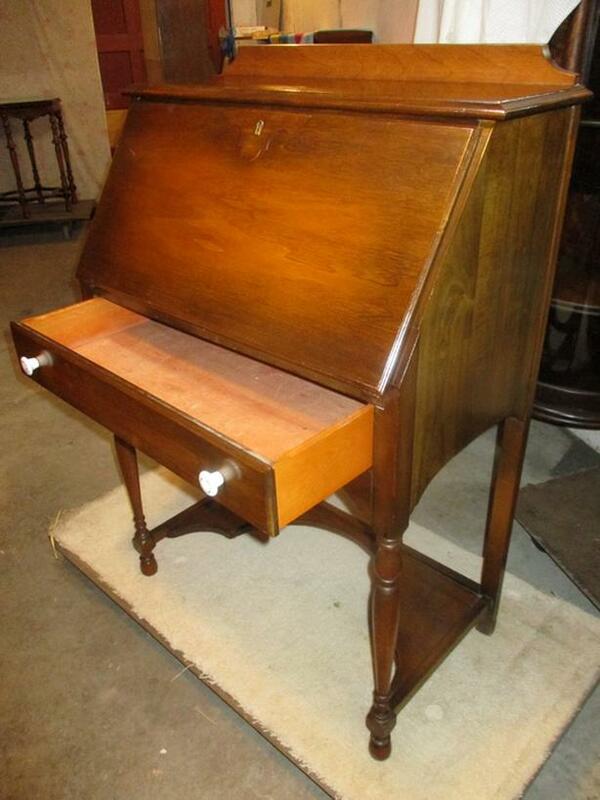 THIS VINTAGE SECRETARY IS IN VERY GOOD CONDITION AND READY TO USE.